My dad is pretty awesome. He gardens like a pro, cooks the best pancakes in the world, and loves his family like no other. But he skips lunch ALL. THE. TIME. when he is at work. Of course, I am a dietitian and believe that lunch skipping is a no-no. Even if it is just a protein bar, the act of stepping away from what you are doing for five minutes to eat something is important for fueling both the mind and the body. So for the days that my dad can’t grab lunch, I have been making him single serving portions of granola for him to snack on in between meetings/calls/huddles. And this Cinnamon Pecan Granola is awesome. It’s hearty and crunchy, but loaded with nuts and seeds to bulk up the protein and healthy fats. 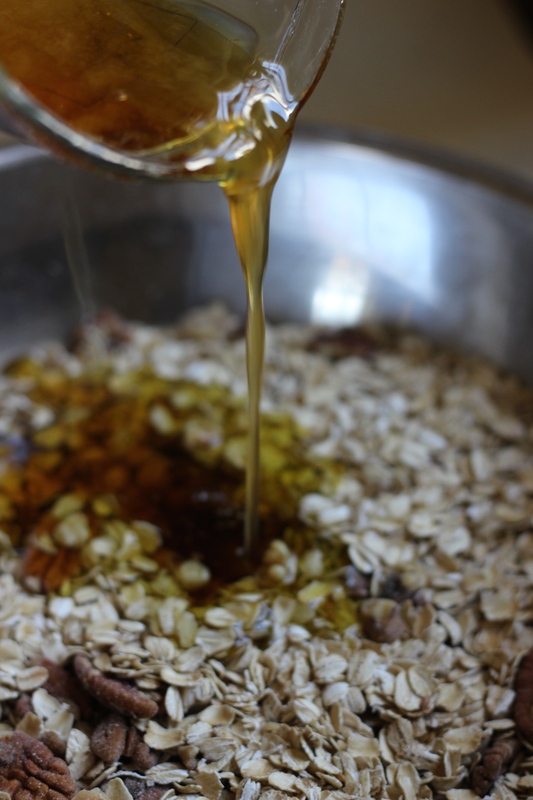 Plus, it has maple syrup and honey… which means the granola clump factor is high. The granola base is simple. Rolled oats, whole pecans, some chopped walnuts (because my dad likes those too! ), shelled hemp hearts, and some flax seed. I then sprinkled over some cinnamon and a touch of salt. I poured over a mixture of oil (both canola and olive), maple syrup, honey, and vanilla extract. I then mixed the whole sticky mixture together, making sure that each oat/nut/seed is coated. And dumped it onto a large rimmed baking sheet lined with parchment paper. I spread everything into an even layer and popped the baking sheet into a preheated oven for 25-30 minutes. Halfway through baking, I tossed the granola (to prevent burning) and then used the spatula to push it back into a more cohesive layer. This is important for the granola clumps later. When the granola comes out of the oven, I added some dried craisins and then broke it into larger clumps. I allowed the granola to cool completely before packaging it up into servings for my dad. And I might have saved some for me as well! A yummy way to start the day (or to have a snack!!). And it could not be easier to make at home! 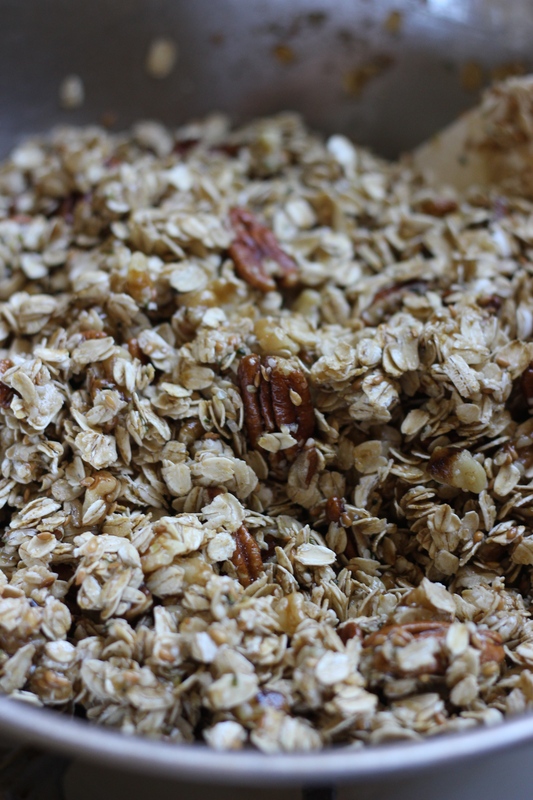 Simply A (RD) Fact: Did you know that oats are a good source of soluble fiber? Preheat your oven to 350 degrees. Line a rimmed baking sheet with parchment paper. Set aside. 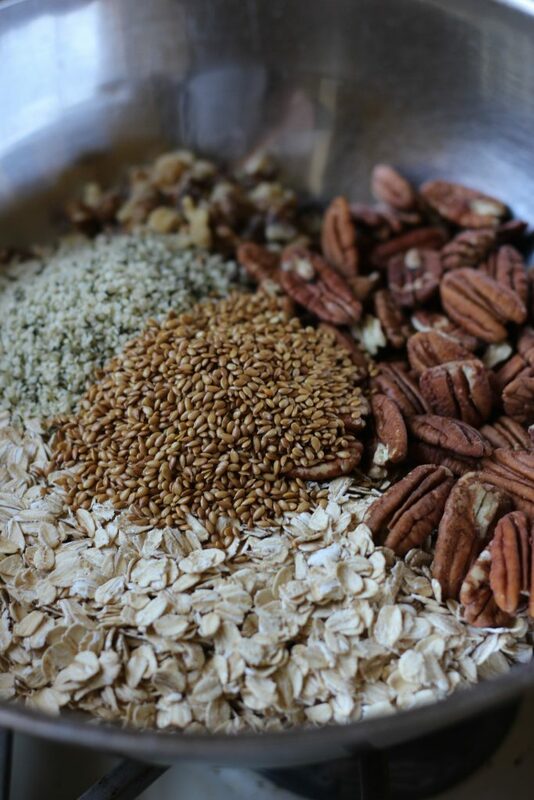 In a large bowl, combine oats, pecans, walnuts, hemp hearts, flax seeds, salt, and cinnamon. Stir to combine. In a small bowl, combine canola oil, olive oil, honey, maple syrup, and vanilla extract. Whisk to combine, making sure the honey is evenly dispersed. Pour the wet ingredients over the dry ingredients, stirring and making sure each element is coated in the sticky syrup. 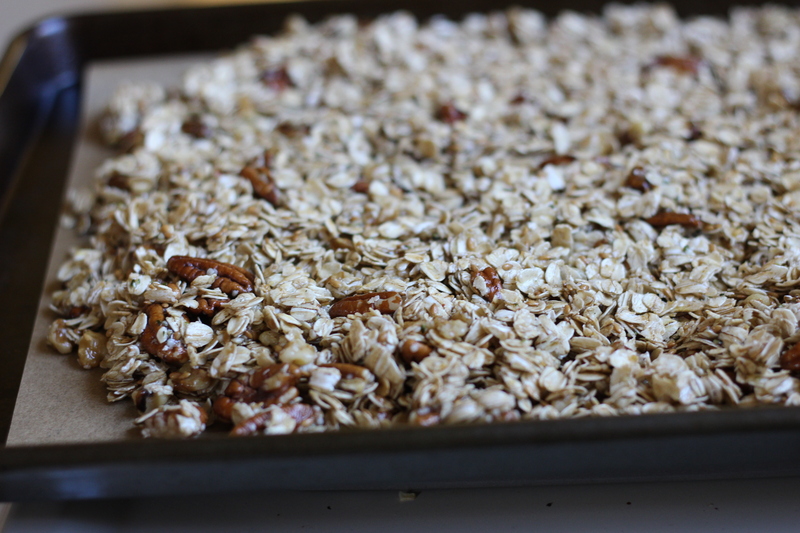 Pour the oat mixture onto the baking sheet, spreading into an even layer. 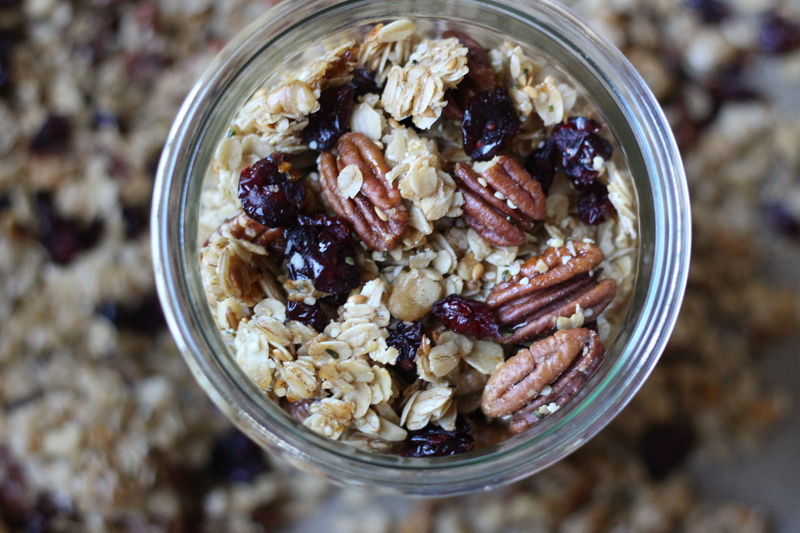 Make sure to press the granola down lightly with a spatula. Bake the granola for 25-30 minutes, stirring halfway. Make sure to press the granola back into an even layer. 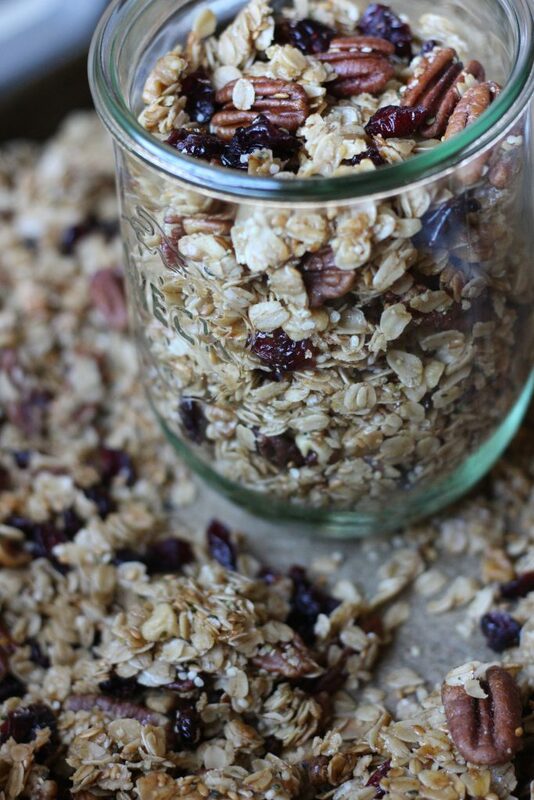 When the granola comes out of the oven, add in the dried cranberries and lightly stir to break the granola into large chunks. 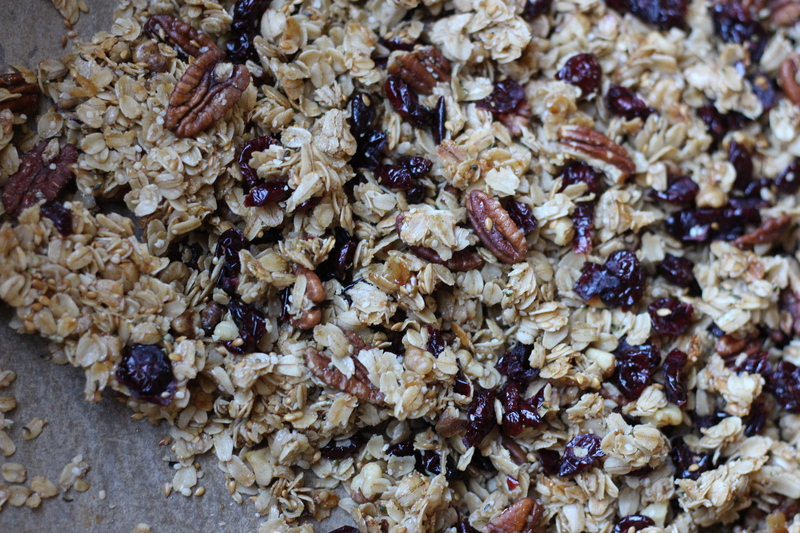 Then allow the granola to cool completely undisturbed to keep those big chunks intact. Store in an air-tight container and use it to top oatmeal, yogurt, or smoothie bowls. Enjoy! Recipe lightly adapted from the Healthy Granola recipe from Cookie and Kate. What a great work snack for your Dad! Your recipe calls for hemp hearts: I’ve never use them.